Food and faith come together in so many ways – at the Communion table, breaking bread with loved ones, and caring for God’s earth and the food that grows from it. Colorado Vincentian Volunteer, Chris Morgan, is using his passions and talents in his volunteer placement to teach kids about healthy eating while living out his faith through volunteer service in Denver. Chris Morgan is the first Colorado Vincentian Volunteer to work at his two placement sites, Cooking Matters and Slow Food Denver. CVV program directors Mary Frances and Bill Jaster recognized his interest in food education and proposed these sites to him as potential placements. Chris says that he has seen the fruitful results of God using his passions during this volunteer year. At Cooking Matters, Chris coordinates six-week cooking and nutrition courses led by chefs and nutritionists to teach people how to cook and shop on a budget. 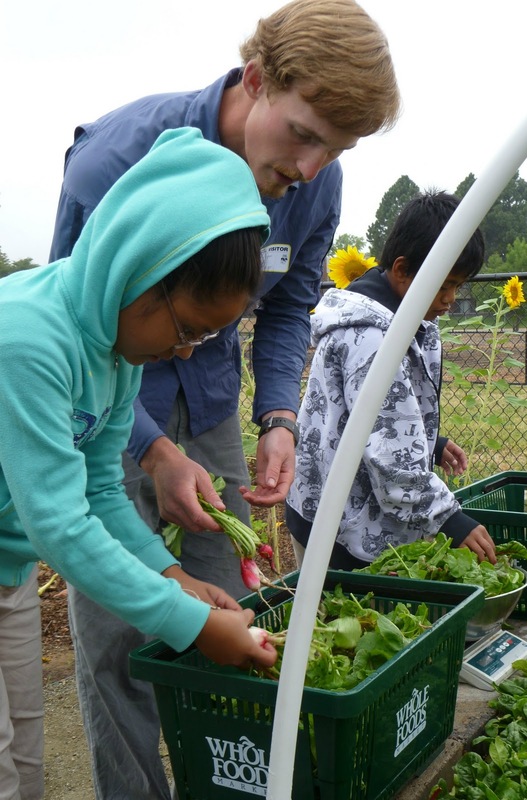 At Slow Food Denver, Chris facilitates garden programming with elementary school students, which includes a youth farmers market and the Garden to Cafeteria program, in which local gardens cared for by students sell their garden produce to the school cafeteria. How do you see food education to be a reflection on faith values? I see this as a reflection on faith values because stewardship is central to our primordial story. God gave humankind dominion over the earth. We are charged with being good stewards of this place. Clearly the contemporary industrial agricultural system does not meet that calling on several fronts. It seems clear to me that active support of ethical methods of raising produce and animals is at the basis of how we are called to interact with the earth as children of God. We all need to eat. Giving people the tools and the knowledge for producing, shopping for, and preparing food truly brings us closer to that calling of stewardship. Can you share an interesting story from your work at your placement site? By far the most common question I get in the garden is, “Can I eat this, Mr. Chris?” I try to say yes as much as possible. These second grade friends of mine typically don’t know what is edible or are unsure whether or not they have permission to eat what they pick. These boys and girls are tasting every vegetable out there and mostly enjoying them. Students become attached to their garden through the work they do there, the fun they have, and the food they eat. I dream that they will graduate from the school with the passion to grow their own produce in their own yard. Even if a volunteer program can’t place a volunteer at a food-focused placement site, how could they incorporate healthy, simple living food habits in the volunteer community? I would honestly recommend looking to see if Cooking Matters offers a course in their area, even for a one time event. It is truly valuable! (See www.slowfoodusa.org). Look around at the resources that are around you. Maybe there is an area close by that you can plant. Try container gardening! Think about composting your food scraps. Find the local gardens around you, and see if you can spend some extra time there. Start seeds inside your house or apartment in March. Shop around the perimeter of the grocery store more than the aisles. Plan your meals, and plan to have leftovers. Use those leftovers! Eat less meat! Substitute that protein for beans, lentils, quinoa, or eggs. I would also recommend eating just to the point where you feel like you could eat a little more, but stop before then. It leaves some room to reflect, some room to let God fill you up the rest of the way. Prepare food and eat with other people. Talk with them. Talk about preparing and eating practices and what they mean to you. How have you been changed through this experience? This experience so far has shown me a lot of different ways I can work in urban agriculture in Denver. It has opened my eyes to the deep need for food in the food deserts that we find all across our city. I have seen how dignifying it can be to produce one’s own food, and it inspires me to spread that. I would love to see more Catholic churches and schools farming on their land. I think it would be a deep source for theological reflection. My desire to pursue urban agriculture has been solidified through this experience! The fruits are there, and it’s beautiful to see God working in my life and the lives of those around me!